X-Small - $49.99 Only 1 left! Standard - $57.99 Only 1 left! Want to really scare your friends this year? Well, then you're going to need to be their worst nightmare! Although finding out that information may prove to be a bit more difficult than you think. The best infiltrator of dreams was the infamous Freddy Krueger. That creepy dude could literally bring anyone’s deepest, darkest fears to the surface. Not only that, he could kill one with their greatest fear! He truly was and is a living embodiment of evil. So if you want to kick things up a notch this Halloween, pass on the vampire and werewolf costumes, those beasts are no match for Freddy. 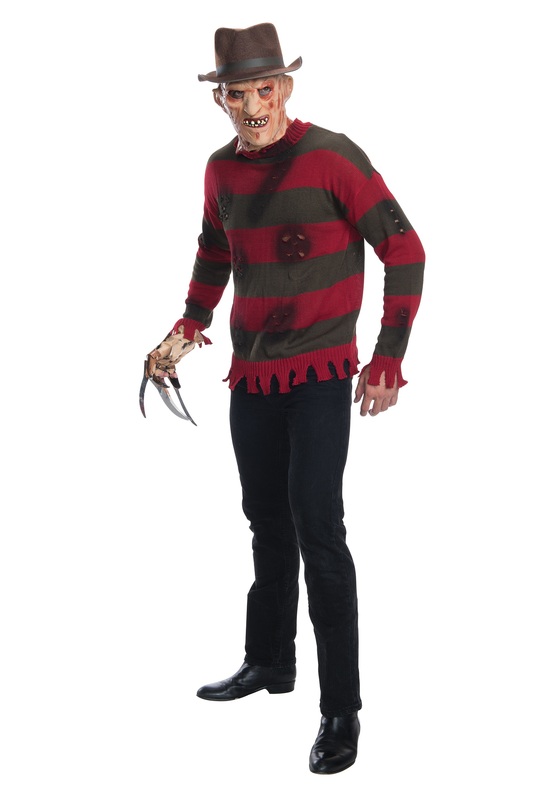 Get your hands on this Deluxe Freddy Sweater and begin your transformation into the most violent and horrific variation of the boogieman. All you’ll need to complete this terrifying disguise is a few accessories that you can find on our site. Add one of our Freddy Krueger Masks to your cart along with a sinister brown fedora and, of course, a pair of his iconic bladed gloves. Once you have all these haunting accessories, you’ll be ready to keep everyone up late at night this Halloween!